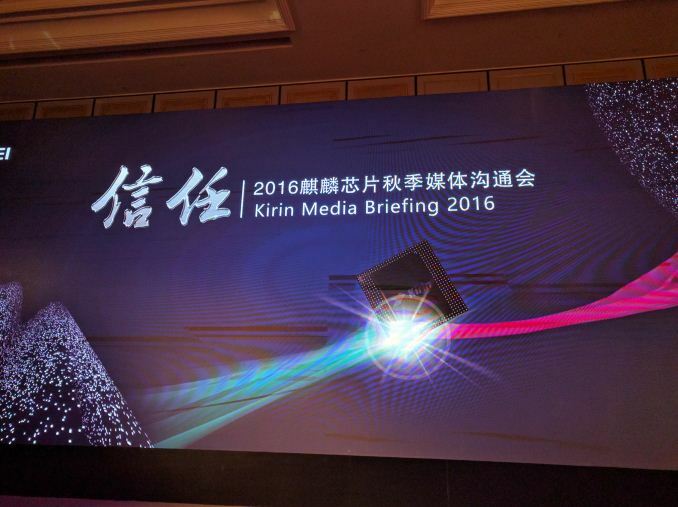 Last year we had the opportunity to attend HiSilicon's launch event of the Kirin 950. The 950 SoC was the first to employ ARM's Cortex A72 in a smartphone, and the big.LITTLE 4x4 A72/A53 configuration of the 950 powered most of Huawei's flagships for 2016. It also marked a significant jump both in performance as well as efficiency compared to previous Kirin chipsets. The CPU part especially made such a good impression in our review of the Mate 8, and at the time we estimated that it would easily trade blows with Qualcomm and Samsung's own custom ARM microarchitecture designs, Kryo and Exynos M1, in their respective SoCs and flagship smartphones. Ultimately the Kirin 950 exceeded our expectations, in part due to the rather lackluster showing of this year's custom-CPU powered Android devices. The Kirin 950 was initially launched in the Huawei Mate 8, their new flagship smartphone. The SoC then followed into the Huawei P9, P9 Max, and the Honor 8 over the course of 2016 - essentially all the premium devices for Huawei and Huawei's sub-brands, and contributing to the 106 million smartphone sales Huawei recorded in 2016 (30% of which were devices over $450). This is the success that Huawei wants to emulate with the Kirin 960. Earlier this year, ARM announced their next generation microarchitecture IP in the form of the Cortex-A73 general-purpose core and the Mali-G71 graphics core. The A73 is a departure from the design of the A72 - the A72 was related to the A57 and A15 (Austin µarch family), whereas the A73 is a successor to the little-used Cortex A17 of the Sophia µarch family. Notable differences between the A73 to the A72 include a reduction of the decode-width from 3 to 2, but don't let this change fool you as the new micro-architecture is supposed to be both faster and smaller (and efficient) than that of the A72. On the GPU side, the Mali G71 is an even bigger upgrade for ARM as it marks the first IP of the Bifrost architecture which brings beyond a nomenclature change from the Mali-Txxx series also significant performance and efficiency improvements. Back in May we said that we would expect SoCs and devices with these new IPs by the end of the year, and indeed, the new Kirin 960 SoC from Huawei's semiconductor subsidiary HiSilicon combines these two new technologies, promising the first commercial device to use them in due course. While more details of the Kirin 960 will come forth over time as it makes its way into various devices, the official launch in Shanghai reiterated the partnership between HiSilicon and TSMC, using the new 16FFC process as the primary technology to enable the new SoC. As a reminder, the new process brings lower manufacturing cost thanks to lower mask count as well as better density due to new cell libraries. 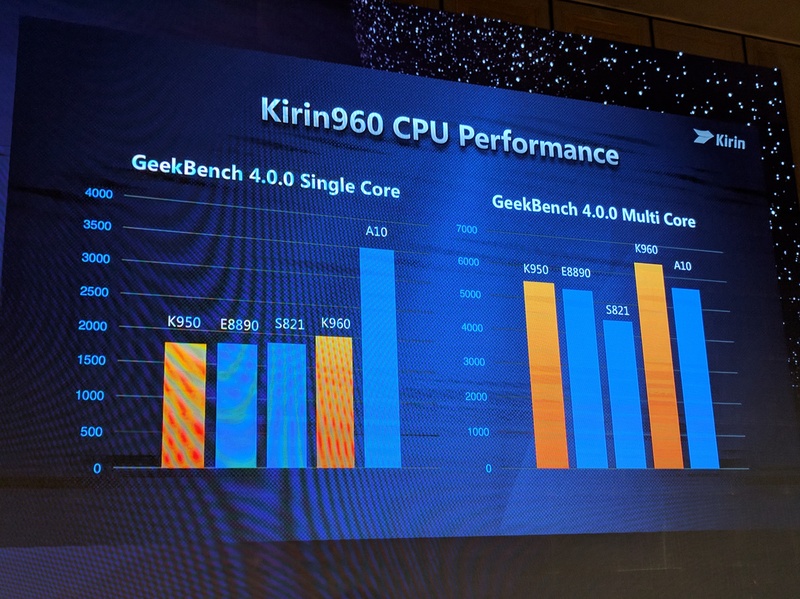 The Kirin 960 features the same 4x4 big.LITTLE design implementation as the Kirin 950, but using four Cortex A73 cores at 2.4 GHz (by contrast, the Cortex A72 cores in the 950 were at 2.3GHz, and 2.5 GHz in the Kirin 955). The little cores remain of the Cortex A53 micro-architecture and at the same 1.8 GHz configuration. Performance for the Kirin 960, as presented in Huawei's announcement, is +10% single core performance and +18% on the multi-CPU performance compared to the Kirin 950. (This isn't quite as much as we would have hoped from an A73 design, though.) HiSilicon presented GeekBench 4 scores for the new chipset and the K960 seems to benchmark around 2000 for single-core and 6400 for multi-core. The single-core scores slightly beat other Android SoCs in the market, however isn't a too drastic improvement. We don't have more exact sub-scores yet but one we know about is the vastly improved memory bandwidth of the new design that seems to beat all other SoCs at the moment. This is surely a result of both the Cortex A73's strong memory subsystem as well as new use of the CCI-550 in the Kirin 950 that also promised an increase in effective memory bandwidth over the preceding CCI-400 design. Initially we expected A73 designs to use the improved power envelope to drive up the clock frequencies higher, however in the case of the Kirin 960 the A73 is merely 100MHz above the Kirin 950 and actually 100MHz slower than the 955's A72. 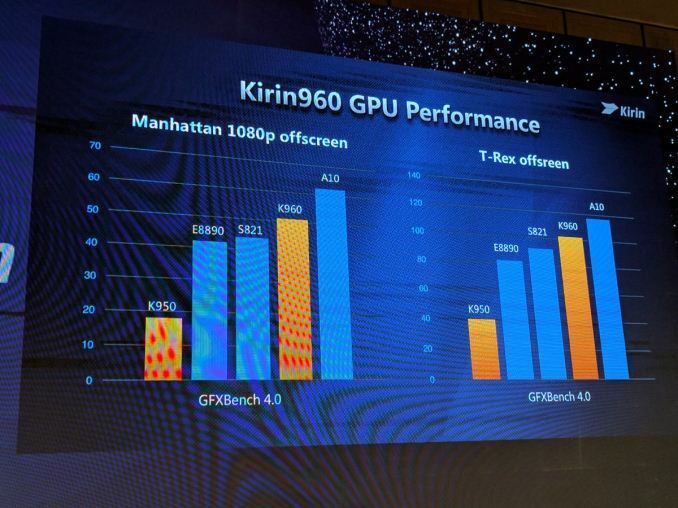 The Kirin 950 already had the best sustainable CPU power envelope among this year's SoCs so it would be surprising if HiSilicon decided to limit performance lower power even more, however we have confirmation that that is exactly what happened as we've been told the CPU's power envelope has been lowered in favour of the GPU. 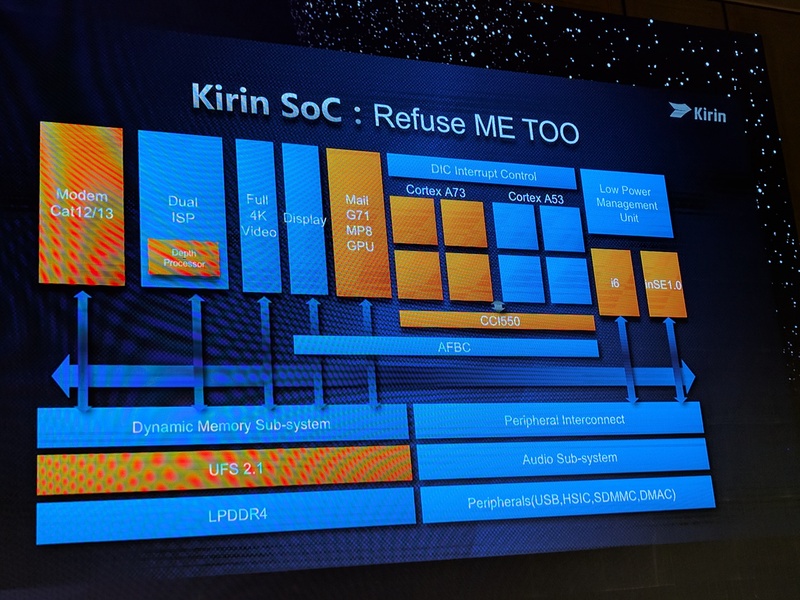 This matches ARM's philisophy about the new A73 that was presented back at TechDay, so the Kirin 960 seems to put this philosophy into practice. While there wasn't talk about power efficiency we expect it to improve given that performance has gone up while power is supposed to have gone down. As mentioned earlier, the GPU sees a significant shift as we move from a Mali T880MP4 to a Mali-G71MP8, which essentially doubles the number of shader cores employed. HiSilicon decision to go with a wider GPU on the same process node was undoubtedly made much easier by the new G71's much better die area efficiency. The new GPU runs at 900 MHz, the same as the older SoC. The combination of doubling the shader cores over the 950 and moving to a new architecture over the 950 results in a 180% increase in the GPU's performance compared to the Kirin 950. As a result, Huawei is positioning the Kirin 960 directly above the other high-end SoCs launched this year (though we expect the other SoC vendors to also have respective increases with new generations soon). GFXBench Manhattan 3.0 and T-Rex Offscreen scores were showing the performance of the G71MP8 in above both the Snapdragon 820 and the Exynos 8890, but a tad under the new A10. 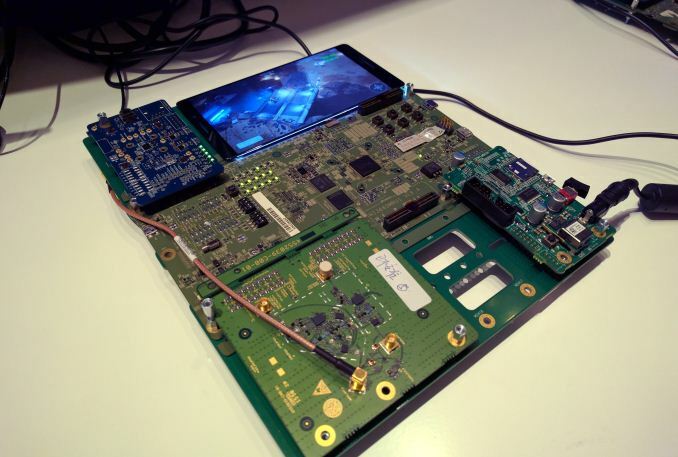 One of the popular criticisms of previous Huawei SoCs is the lack of graphics horsepower, with designs often opting for a four-core 'MP4' configuration despite using the high-performance graphics cores available from ARM. An MP4 configuration kept the die size of the SoC small and easier to implement. The downside of this is typically efficiency, suggesting that high graphics loads with fewer cores run at a worse point of the power efficiency curve to get an acceptable result. Arguably most graphics scenarios on a smartphone, apart from extreme gaming titles and VR, can easily be provided by an MP4 configuration, and that was HiSilicon's main rationale for past GPU configurations. However as Huawei devices mature and get more premium, there is also the fact that when buying a device above $450, the user should expect something performing near the best in the market, and it was clear that an MP4 design could not do that. 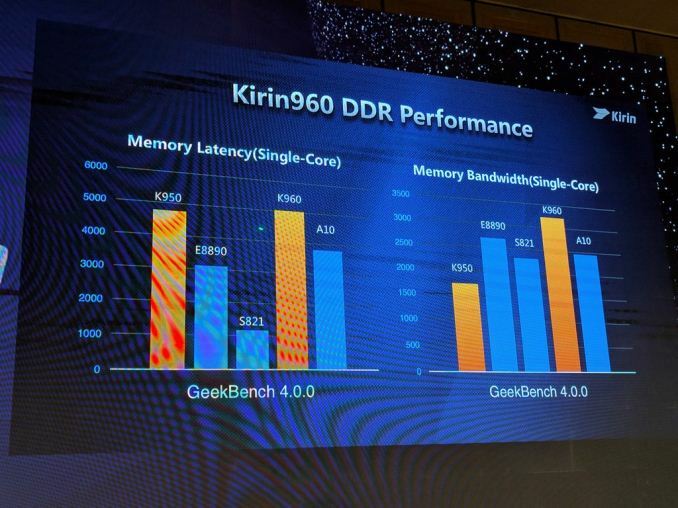 The fact that the Kirin 960 moves to an MP8 design, while increasing die area and maximum power consumption, means that a Kirin SoC moves up to compete with larger GPU configurations such as Samsung's large Mali designs in Exynos SoCs, Qualcomm's Adreno in the Snapdragons, or the 6-cluster PowerVR GPU in Apple's A-series. The mention of higher maximum power consumption comes with rather mixed feelings as the reasonably low GPU power was one of the aspects of the Kirin 950 that we especially praised when compared to other SoC designs, so we'll have to wait to see real devices to see if this improvement isn't a double-edged sword that introduces more severe GPU thermal throttling to the Kirin lineup. Nevertheless, the improvement paves the way for things like VR, especially given Google's recent announcement of Daydream VR (starting with the Snapdragon 821 in the Google Pixel smartphone). With the right software support and display, we would expect all future devices using the Kirin 960 to support Daydream VR. With API support, the Kirin 960 will be promoted with Vulkan. The Kirin 960 also features a new HiSilicon based modem, allowing up to LTE UE Category 12/13 connectivity for up to 600 Mbps transfers, equaling the specifications of Qualcomm's Snapdragon 820 or Samsung's Exynos 8890 modems. 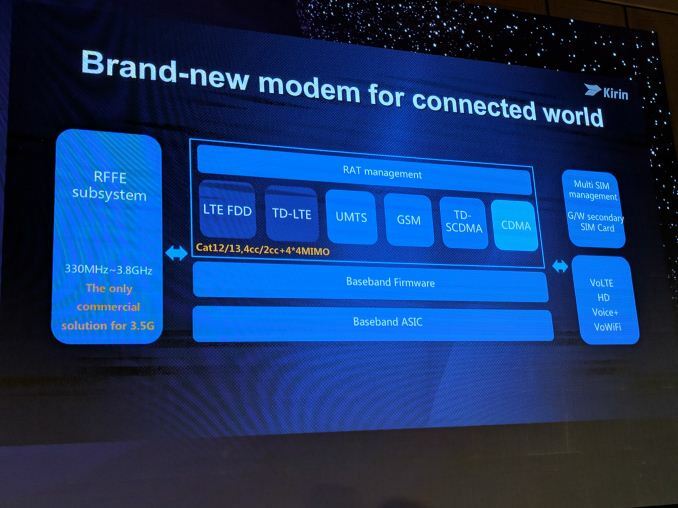 The modem is being promoted as the first commercial SoC to provide quad carrier aggregation to meet that speed, although it will obviously require carrier support in the region in order to do so. The modem supports 4x4 MIMO (at only 2xCA) as well as up to 256QAM spatial stream modulation. One of the more interesting announcements from the Kirin briefing was the implementation of CDMA in the modem. Currently three smartphone modem providers have CDMA solutions (Qualcomm in integrated and discrete modems, Intel with discrete, Mediatek with VIA-based integrated), and we spoke with HiSilicon to confirm that this is a brand new custom CDMA solution, rather than a licensed platform. The value of CDMA is mixed, although a required element with certain carriers in China and the US, such that Huawei can now offer devices with the Kirin 960 can compete. It should be pointed out that CDMA certification for the US via the FCC takes 18-24 months, and I was unable to confirm when the process was started, so we may have to wait another year for a US-focused CDMA devices. We noticed that previous Kirin modem designs were made under the 'Balong' name, however the name is dropped for this model. We were told that Balong is an old brand, and it was being dropped at this performance level, although it is unclear if the modem in the Kirin 960 or future SoCs will be branded. This may be related to the fact that when asked about the presence of CEVA LTE IP in the modem similar to previous models, we were told that the LTE design in the new modem is a custom internal design without CEVA. The multimedia capabilities of the new SoC have also seen a great improvement as we finally see 4K recording made possible. The new chipset supports 4K30 HEVC/H.265 decoding and encoding. The camera ISP is improved as well and brings new features natively supporting dual-sensor RGB/Monochrome configurations such as found on the Huawei P9 and Honor 8. Previously these had relied on an additional external ISP chipset to make use of the new monochrome sensor. Naturally we expect Huawei's next generation flagships to implement the Kirin 960 and variants over the next few months, especially as we move more towards Mobile World Congress in February. Similarly, updates to Kirin such as clock speed increases (the 955 is +200 MHz over the 950) moving into the middle of next year, along with an Honor device or two as time goes on. Huawei still keeps its HiSilicon SoC portfolio purely in-house, such that other smartphone OEMs do not have access to it, and given Huawei's current success in unit sales and revenue, we would expect the continue the status quo on this front. As perhaps was to be expected, when we asked Huawei about competitor's 10nm plans (especially in light of recent news), no official statement was made. It's very hard to not try to theorise comparisons between the Kirin 960 and next year's Exynos and Snapdragons, while the former does bring substantial improvements to the table, it'll be a hard fight competing against the new generation. Given Huawei and HiSilicon's semiconductor product cycles, we might expect to hear more when TSMC's foundry business starts making more public noise about the availability of future nodes and silicon mass production (or even Intel, depending on relationships). We will probably have to tune in next year, perhaps at a similar time, and there may be more concrete news about chipset roadmaps. We expect the first devices to use the Kirin 960 to come out shortly. Do remember that 10nm SoCs are some 5 months ahead so if Mate 9 launches next month, still 4 months to go. So far we have received five production tapeouts for high-end mobile products. We are preparing capacity for 10-nanometer production ramp up by the end of this year and expect shipment in first quarter next year." You make it sound like we don't know much about TSMC's timing, had to fix that. Y-day Honor x6 launched with Kirin 655. It's a minor upgrade over 650 but could get a mention. Are you guys covering ARM TechCon next week? The only missing bit from kirin950 was the GPU.